The High-Definition Multimedia Interface (HDMI) was invented in 2002 by several major electronics manufacturers. HDMI is the first uncompressed all-digital interface that carries audio and video signals. As the specifications evolved, a different version was introduced. The first version was HDMI 1.0. The latest version is 1.4. The HDMI 1.4 version supports high-speed Ethernet channels with an audio return channel, allowing users to take advantage of their IP-enabled devices without a separate Ethernet cable. HDMI Ethernet channel technology consolidates video, audio, and data streams into a single HDMI cable, combining the unmatched signal quality and convenience of HDMI connectivity with the power and flexibility of home entertainment networking. It incorporates a dedicated data channel into the HDMI link, enabling high-speed, bi-directional networking at up to 100 Mb/sec. Entertainment devices, from TVs and gaming consoles to DVRs, are now available with networking capabilities. By adding an Ethernet channel, the HDMI standard is advanced, allowing consumers to benefit from Ethernet connectivity via HDMI. If a consumer had a TV with a built-in tuner or DVD player, and would like to send content “upstream” from the TV back to the audio system, a separate connection had to be installed, typically an S/PDIF cable. 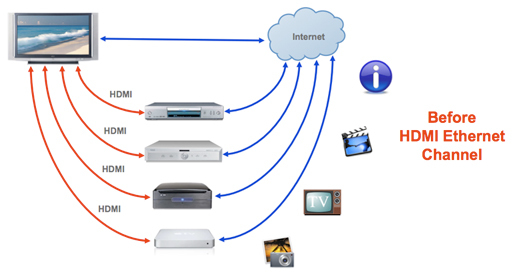 An audio return channel enabled TV can either send or receive audio via HDMI, upstream or downstream, depending on system set-up and user preferences. The HDMI 1.4 specification has the protocols for a number of popular 3D displays, which will be capable of transmitting 3D pictures in full 1080p. HDMI 1.3 does not include such support. 3D technology is evolving rapidly with several competing approaches under development. The HDMI 1.4 specification adds support for extremely high video resolutions that go far beyond today’s 1080p systems, such as 3840 x 2160 and 4096 x 2160, which is four times the resolution of today’s 1080p. What is so great about this is that 4K displays will give high end home theaters the equivalent quality of commercial digital cinema projectors. If a consumer wants to view their digital photos on an HDTV, HDMI 1.4 supports additional color spaces or color gamuts, which allow better and more accurate color rendition. RGB is still the dominant color space, but new standards are becoming popular, such as sYCC601, Adobe RGB color, and Adobe YCC601, each of which has a larger palette of colors that are closer to the range of colors perceived by the human eye. A Type A connector has nineteen pins, with bandwidth to support all SDTV, EDTV and HDTV modes. The Type B connector has 29 pins and can carry six differential pairs instead of three, for use with very high-resolution, such as WQUXGA. The Type C connector is a mini connector defined in the HDMI 1.3 specification, and is intended for portable devices. It is smaller than the type A connector but has the same 19-pin configuration. The Type D connector is a micro connector defined in the HDMI 1.4 specification and it keeps the standard 19 pins of types A and C but shrinks the connector size to something resembling a micro USB connector. The pin assignment is different from Type A or C. Type E is the final connector and is used in the automotive industry. This connector has a locking tab to keep the cable from vibrating loose, and a shell to help prevent moisture and dirt. A serious issue with the movie industry is illegal copying of DVDs. To prevent this, HDMI incorporates content protection called HDCP (high definition content protection). HDCP eliminates the possibility of intercepting digital data midstream between the source and the display. Because of this, analog connections will be phased out. A HDMI source, such as a Blu-ray player, may require HDCP compliance of the display, which prevents the output of HDCP protected content to be transmitted to a non-compliant display. Some high-end home theater projectors have HDMI inputs but are not HDCP compliant. Most HDMI cables are relatively short. Long Cables can cause instability of the HDCP and possibly image blinking, because the DDC (digital down conversion) signal is weakened. DDC allows a signal to be shifted from its carrier frequency down to baseband. The technique greatly reduces the amount of effort required for subsequent processing of the signal without loss of any of the information carried. Signal loss has always been a problem with HDMI over a long distance, unless the consumer used a large gauge cable, which was unwieldy; plus this type of cable pulled away from the electronics due to strain. Now there are thinner cables capable of producing full bandwidth and data over greater distances, using active amplification. One approach to extending the cable length is using active HDMI cables with electronics within the cable to boost the signal and allow for HDMI cables of up to 98 feet. One company, RedMere Technology Ltd, uses microchip active HDMI technology, which operates off the power supplied by the sink device to provide more signal strength amplification than traditional in-line amplifiers up to 65 feet. A HDMI extender is another method of sending a signal a long distance, using power from an external power source. Several companies offer amplifiers, equalizers, and boosters that can string several standard HDMI cables together. HDMI extenders that are based on dual CAT 5 or CAT 6 cable can extend HDMI to 820 feet, while HDMI extenders based on optical fiber can extend HDMI to 980 feet. HDMI extenders will give the assurance that detail will not be lost in a high definition picture, even if a DVD, satellite and/or cable receiver is far away from a television or projector. 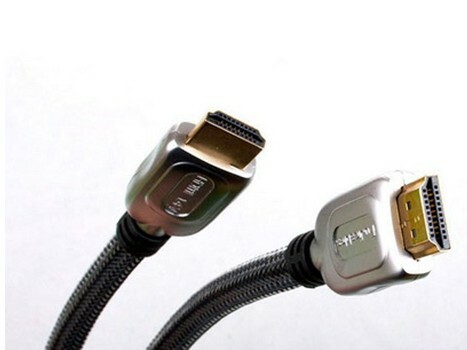 The extenders are connected at the end of an HDMI cable or used to chain two HDMI cables together to create a longer HDMI extension. 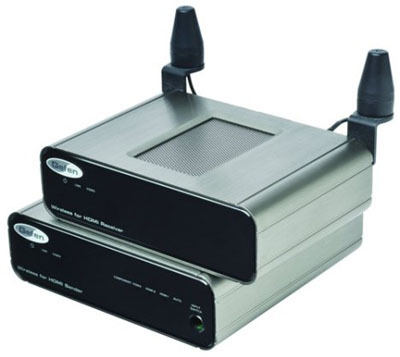 The extenders work by regenerating the high definition video and digital audio signal that it receives from the source device and transmits the signal to the second cable at the receiving display. Gefen LLC has developed a wireless HDMI extender for transmitting up to three HD AV sources up to 30 feet without wires. The Gefen Wireless for HDMI Extender is able to accomplish this by employing Ultra-Wideband (UWB) technology to send the large amounts of data required by the HDMI standard. The 30 foot line-of-sight distance (less if going through a wall to an adjacent room) is achievable with resolutions of up to 1080p. Setup takes minutes without the hassle of running cable through the wall or ceiling. This unit doubles as a High Definition AV switcher. There are three High Definition AV inputs (2 HDMI and 1 Component) that are selectable by the transmitting unit. 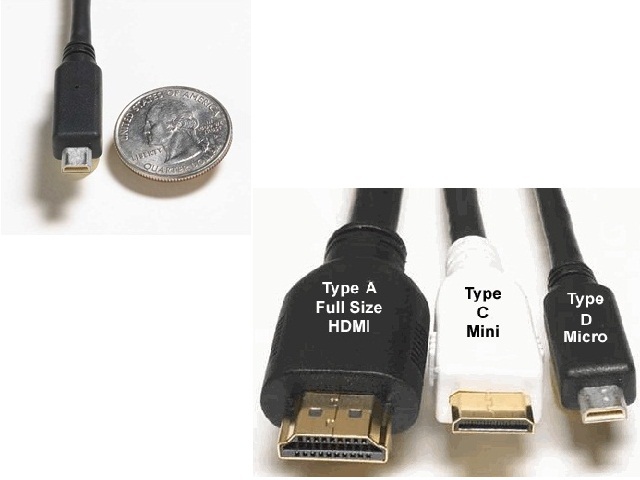 HDMI is backward compatible with single-link DVI – D or DVI – I, but not DVI – A. No signal conversion is required when an adapter or asymmetric cable is used, so there is no loss of video quality. 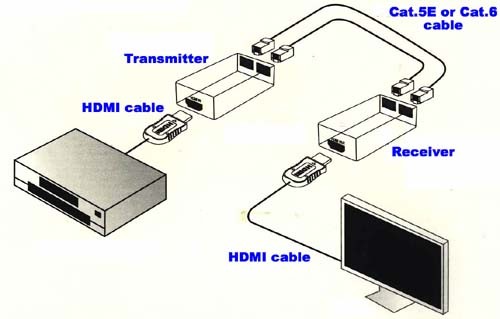 Personal computers with a DVI interface are capable of video output to an HDMI-enabled monitor, as they are compatible, but an interface will be needed, while some personal computers include an HDMI interface and may be capable of HDMI audio output, depending on specific hardware. The Blu- ray disc and HD DVD players, introduced in 2006, offer high-fidelity audio features that require HDMI for best results. HDMI 1.3 can transport Dolby Digital Plus, Dolby True HD and DTS-HD Master Audio bitstreams in compressed form, but not in uncompressed, as with version 1.4. Most late model consumer camcorders and many digital cameras are equipped with a HDMI Type C connector. New laptops and tablets have built in HDMI, but the type of connector will vary from manufacturer to manufacturer. The more recent mobile phones support HDMI with a Type D connector. Older televisions and projectors can be connected to HDMI, but the equipment is expensive and the image is not up to true HDMI quality. 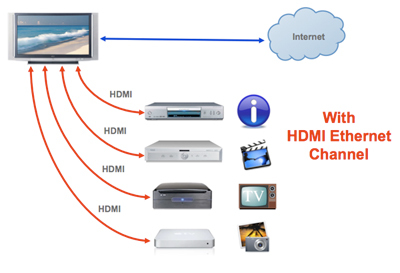 HDTV technology is changing rapidly with HDMI becoming the standard in HDTV connections. HDMI1.4 offers features that are optimized for today's 1080p displays, while looking to the future. With HDMI carrying not only video but the audio as well, we will see all consumer products using HDMI to cut down on cables, but at the same time, HDMI will increase image quality way beyond the ability of the human eye to perceive. HDMI's pure-digital interface is the best way to connect high-resolution components, such as HDMI equipped high-definition TVs and home theater receivers, Blu-ray players, PlayStation® 3 and Xbox 360™ game consoles, as well as HD-capable satellite and cable TV set-top boxes. Looking to the future, HDMI will be the only HD-capable connection.